Piper is sitting in the back room of No.22. PIPER: Hey guys! So, today I am going to be doing something a little bit different...but kind of going back to my old school, original Pipe Up roots...so today, I'm going to be sharing with you my top five favourite books. PIPER: And before you guys say that reading's lame and it's for nerds...nerd culture is actually really cool now, and to be intelligent and intellectual is really cool nowadays and...in the words of my grandad...'It's hip to be a square'. So...on that, let's get started with the video. 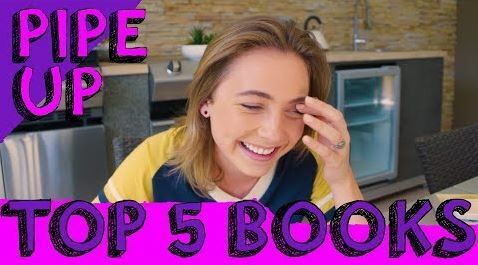 PIPER: OK, so, before we get into the video of my top five favourites, I want to explain to you guys why I love reading so much, and why I think everyone should read. And maybe for you non- readers out there, these little insights could inspire you to start reading? So, number one for me is, it stimulates your mind. We live in this culture and this generation where everything's on demand. Food, at a click of a button. Any series you can just sit down and be in...become like one with your couch(!) We are the generation of ruining our posture. So, reading stimulates your mind, it gets you thinking. She looks into the camera. PIPER: My favourite word is thicket. PIPER: Reason number three as to why I love reading is because it hones my analytical skills, and what I mean by that is like...the more...if you're reading, like, crime novels all the time, you start to pick up clues a lot quicker the more you read them...so like, for example, you get to like page 6 and be like, 'Oh my God, I know who did this, it's the guy with the velvet pantsuit who walked around with a picture of his dead aunt all the time...' And then you get to the end of the book and boom! You're right, it was velvet pantsuit guy. And you start to implement it into real life as well, you know, like, who ate the cookie from the cookie jar sort of stuff. You know, you could start like...be like, 'You're a suspect, you're a suspect' in real life. Um...what's that show? How to Catch a Murderer? No, Making a Murderer? How everyone thought they could become detectives and police officers, that's what I'm talking about...with books. PIPER: OK. Moving on to the actual segment of this video. And that is my top five favourite books. Book number one is 'The Girls' by Emma Klein. She holds up the book. PIPER: This book...is everything. I even got Mum to read it. It is amazing. So, short synopsis. It is...about a girl, set in the late sixties, who joins a Manson- like cult that does...Manson- like things...and there are Manson- like consequences. It is so *beautifully* written...like it's, slow...and the way...he...she...could describe the way that someone's hair falls...in like a whole chapter. And you don't get sick of reading it. It's incredible. PIPER: And you don't actually read it, you just...look at Spark notes or you watch the movie adaption, or you skim read it. But this one...is just *so* beautifully written, and it's so Australian. And the characters are just...I would have read it regardless of being forced to read it. So...and it's one I'm definitely going to read again. So, yes. 'CloudStreet'. PIPER: My third favourite book of all time is another classic, and this one isn't...I'm talking like *proper* classic, like Penguin classic. Not like a cool, retro- inspired book that's got all this Instagram hype and then...Emma Roberts book club, or Emma Watson...whoever it is, I don't know! It's a proper classic! I'm talking hundreds of years old and yes, that's right ladies and gentlemen, it's 'Pride and Prejudice' by Jane Austen. And I know what you're thinking...a lot of people think that it's dated and it's no longer relevant, especially in today's society, that we're no longer a patriarchal society...and how it's based on like a woman's worth to be married and to be married to a wealthy man, and a lot of feminists don't like it... But guess what?! It's ironic. And as soon as you realise that when you're reading it, it becomes fricking hilarious! The idea of the mother trying to marry off her five children...it's ridiculous, and once you realise that and start reading it from that angle, you can just appreciate it for what it truly is...yes. She pauses, a bit embarrassed. PIPER: I feel like I got very hysterical there! Hysterical's also, like, a feminist trigger word. So I shouldn't be using that. She looks into the camera again. PIPER: Brace yourself. Because this next one isn't...it's...it's not fiction. And I'm going to say, it's a biography. I know! It's a scary word. But...this one is incredible. It's about Zelda Fitzgerald, it was written by Nancy Milford...it's inspiring, it's educational, it's all the good stuff. I'm surprised it's not a Year 12 novel. It's all the good stuff. I hear you asking, 'Who is Zelda Fitzgerald?!' And originally, I was like that as well. But my God! She is the most underrated writer. Get on to it! Trust me! So, like, I know this fantasy- style genre isn't for everyone, and it's a bit of a stretch and no- one's really into it these days....I mean, there's no series or anything about it...but...if you're bored and you've nothing to do, definitely buy one of the Harry Potter books. I don't know if you guys have heard of it. Give some money to this struggling author and I'm doing my bit, I'm giving her some much- needed publicity her on my channel...so yeah, 'Harry Potter and the Philosopher's Stone', it's a bit of a mouthful...I should probably, like email her and, you know, tell her to change the name. Needs to be something a sharper, 'Pipe Up' for example! 'Just Jack'! PIPER: Anyway...I'm sure you guys have heard of J K Rowling or Row- ling...people say Rowling or Row- ling...I have started reading the series. And it is SO GOOD! If you haven't read it, you need to. She looking into the camera. PIPER: Alright, guys, that's it, they are my Top Five favourite books. Comment down below what your favourite book is...um...but, yes, I will see you guys next week. I'd like to say, this Hufflepuff...(to herself) oh, shut up, that was so lame!